The V-1541 disk contains files to allow a stock Commodore 64 computer to access files on CommodoreServer.com with standard LOAD and SAVE operations and, as of 2.0, through an exposed API. V-1541 uses the RS-232 port to communicate with the server, so a serial-to-ethernet adapter is required. 0 " 38K BAUD "
0 " 2400 BAUD "
2010-Sept. 24 - New V-1541 with minor bug fixes. 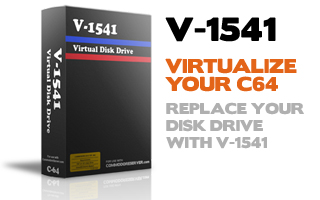 Please run V-1541UPDATE to get new version. 2011-Feb. 4 - New V-1541 with minor bug fixes and enhancements. Now type LOAD "@LOGIN,PIN",2 to login. 2011-Feb. 25 - New V-1541 v1.4 with SAVE command bug fix. 2011-May 6 - New V-1541 v1.5 - Better user experience. 2011-Dec-13 - New V-1541 v2.1 - minor bug fixes, better user experience, exposed API, and now includes V-1541 at 38K baud. LOAD updater to upgrade your Comet64 to 38K baud as well as update V-1541 files on your master disk. 2012-09-13 - New V-1541 v2.2 - SYS49152,<device #> for multi-loading programs. Also new CometChat v1.4 (faster than ever). Removed Apps/Games and put them on a new disk called CSApps.d64 in the public directory.